DETEX ALARMED PANIC HARDWARE – WHEN YOU NEED TO KNOW EVERY TIME A DOOR IS USED! DETEX is a range of heavy duty panic hardware fitted with a loud alarm, which can be bypassed by authorised users using a standard key or Astral Tekno S01 keys . 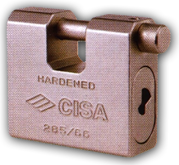 The key by-pass can be Master-keyed and Keyed-alike to client specifications. To understand the broader issues of Fire and Emergency Exits, download What is Panic Hardware? For a very abbreviated overview of the UL-Listed DETEX range of panic hardware which we have been offering in South Africa since 2001, please click here to download DETEX alarmed products. DETEX V40 SERIES meets South African requirements for “escape initiated by body weight.” Pressure against the surface mounted aesthetically pleasing heavy-duty panic latch opens the door, setting off a loud alarm on most models, (the alarm is reset by using the key). The stainless steel deadlocking latch will allow the door to re-lock once it closes, to prevent unauthorised entry. DETEX V40 series bars are the preferred solution. They are UL-Listed and are tested to withstand over 600 kg of pull pressure from outside! DETEX V40 series options include stand-alone models with battery powered alarm, mains powered alarm with battery-backup, micro-switches for remote monitoring to a control room or alarm system, rugged weatherised versions for outdoor use, delayed exit models with full monitoring and bypass facilities, and one with an electrically retractable latch – allowing legal fire escape and access control in one neat and secure solution. DETEX V40 series are the preferred alarmed exit solution! For more details View the Detex V40 Range on a separate page. An explanatory leaflet on the use of panic bars with vertical rods for the ‘fixed’ leaf of double doors – will assist you to use a DETEX product on the moving (first-opening) leaf of a pair of double doors, and show the extra hardware needed. Click on DETEX V40 on Double Doors to see the hardware. We can send you measurements, drawings, installation instructions – or you can see more at www.detex.com. Note that not all products shown on the DETEX website are stocked in South Africa but we will import them for you in viable quantities, on a cash-with-order basis. The DETEX products listed below relate to DETEX products for door-frames that are too narrow to allow the DETEX V40 series to pass through the opening. DETEX ECL-600 is a heavy-duty, fire-rated, stand-alone, surface mounted escape lock with a large red exit paddle, which we recommend when the door-frame opening is too narrow to allow the DETEX V40 series to pass through the opening. Pushing the paddle withdraws the latch-bolt and the deadbolt simultaneously, sounding a loud 95dB alarm. After escape, the door re-locks automatically when closed. The alarm can only be reset by means of the by-pass key, which also re-locks the deadbolt. No wiring or external electronics are required with battery-only 9-volt models. Options: Mains power with battery backup, remote monitoring, high security key for alarm. DETEX ECL-230D is a heavy surface mounted deadlock only (NO latching action) generally only used when the door frame opening is too narrow for either DETEX V40 series or DETEX ECL-600. Pushing the large red exit paddle will unlock the door and sound a loud alarm, enabling an immediate reaction. No wiring or external electronics required with this 9 volt battery-only alarm. Options include a longer push-bar, and high security key for the alarm bypass. Click here to see a detailed PDF of DETEX ECL-230D . DETEX EAX series loud Exit Alarms are suitable for doors that already have conventional panic or other exit hardware, or any door that needs a loud local alarm. The 95dB alarm sounds IMMEDIATELY the door is opened, and is reset by means of the by-pass key. Both models have audible and visual indicators for armed or disarmed mode and for low battery status. DETEX EAX-500 is a surface mount standalone alarm unit with a 9-volt alkaline battery only operation, illustrated at right. DETEX EAX-2500 (illustrated at left) is available in surface mount or semi-flush mounting. Operating on 12 – 24 Volts AC or DC, they have an output for an alarm relay, and a 9-volt internal alkaline battery as a backup. Available in black finish on special import. DETEX EAX-300 stand-alone alarms can be use to monitor any door that is intended to be opened – but not to be left open beyond the pre-set time. Identical in appearance to EAX-500 shown at right above, they are UL-Listed. The alarm sounds only if the door has failed to close within the pre-set time. DETEX EAX-300W is the weatherised version of DETEX EAX-300, tested to US Military Specifications for dust and driving rain, and is suitable for outdoor use. We offer genuine SABS approved Fire-Rated Doors made to order by Allandel in Cape Town. From a single door – to doors and frames for an entire complex – we can supply and deliver top quality Fire Doors fitted with the correct regulation compliant hardware made by Briton, CISA, DETEX and Dorma. Why take a chance on anything else? Click on Allandel to see the specifications and classes of doors and fire-proofing available. ASK THE LOXPERTS! Between four of our LOXPERTS at THE LOCKSHOP we have over 110 years of security ironmongery experience! Please ask us if you need any further information or assistance with specifications. You can also ask us any item of hardware for doors, emergency exits, access control, door closers etc – in fact EVERY-THING-FOR-EVERY DOOR!